Our automated email campaigns allow you to reach out to your recent customers over time to facilitate a steady stream of reviews. Follow the steps below to get the most out of your campaign. Before accessing any campaign features, you must first complete the initial campaign setup by filling out the fields in the Setup Email Invite Campaigns window. Once you have completed this setup, you’ll have access to all campaign features. By default, the first email to a recipient will be sent out Immediately after a recipient becomes Active (more on this below). Deactivate recipients on Click will also be turned on. You can adjust both of these settings in the setup window. Please note: using a free email address – e.g. Gmail, Yahoo, Aol – in the From email field can cause your campaign emails to bounce. Before sending out any emails, take some time to customize your email campaign. This will help convert more customers into reviewers. Consider personalizing or intensifying the wording of the emails. The default language is serviceable for a wide range of businesses, but the more directly you can speak to yourcustomers, the more you stoke the sense of reciprocity that motivates them to complete a review for you. If you need some ideas, consider mining your existing reviews for other motivators to touch on in your email messaging. For example, highlighting yours as a local business that needs your customers’ support to compete with the Big Guys – people love to be needed and many want to support your business. To get started, go to Dashboard > Invites > Email. While you can upload recipients one-by-one (click the Add a Recipient button), you can upload a high volume of recipients at once by creating a CSV or XLSX file. Upload your file by going to Dashboard > Invites > Recipients and clicking the Upload CSV/XLSX button. Individuals and 3rd party platforms looking at your review will think something is odd if you have a lot of reviews over a very short period of time. We typically see a 15 to 20% review conversion rate so requesting reviews over a number of months will make your company more authentic. They’re manually moved to the Active Recipients list (after clicking Activate all Pending Recipients or toggling the ‘check mark’ in their entry on/green). This feature will automatically move a set number of recipients to your Active Recipients list every day (provided that there is enough room on the Active recipients list – you are limited to 100 active recipients by default). To turn on this feature, set Auto-activate pending recipients daily? to Yes. You can then set how many recipients per day you’d like to activate (the default is 10). Inactive recipients stay on the list for 180 days (unless you manually delete them or change the expiration date), after which they can be re-added as active recipients. The system will prevent you from re-uploading recipients on the ‘inactive’ list, thus preventing you from sending your campaign to the same customer twice. 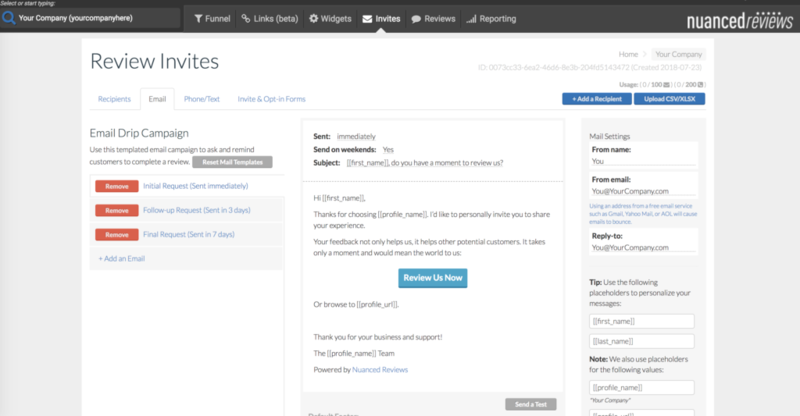 You can use our shared invite and opt-in forms to engage staff, clients, and end customers in the recipient adding process. Access these forms at Dashboard > Invites > Invite & Opt-in Forms. The shared invite form is a password-protected web portal that you can give to staff or clients to let them add recipients one-by-one or via bulk upload. The opt-in form can be presented to the business’ customers to have them opt-in on-site and move directly to the Active Recipients list (if the list is full, the recipients will instead go to Pending). Please note that while our system benefits from high deliverability, a certain percentage of emails (around 15 percent of all opt-in marketing emails) will inevitably end up in spam filters – even if you’ve done everything “by the book”. If you’re continually experiencing issues with spam filtering, get in touch.